It’s shaping up to be a crazy week month too. My boss announced that a co-worker and I will be spending a couple of days at a tech conference in the bay area this week which is great I guess, but a little more warning would have been nice! It was a scramble confirming the details and finding a reasonable hotel with such short notice. 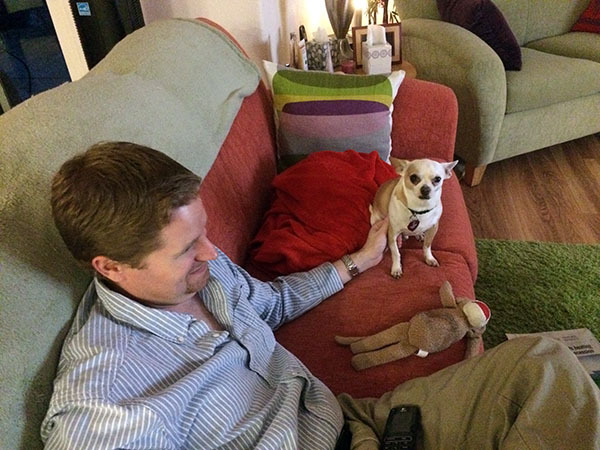 And I’ll miss these guys for a few days, boo. Over the weekend we had another family gathering at my sister’s house with a casual burger and fries menu. 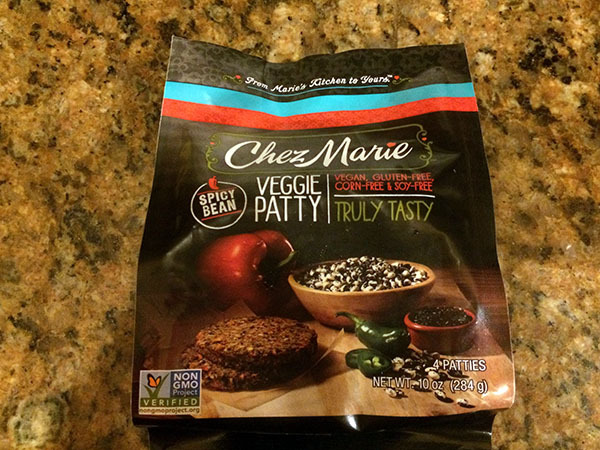 My sister grabbed these Chez Marie Vegan Spicy Bean patties for us to try. There were one of the few that were also gluten-free and very veggie looking. Cooking instructions were simple, brown on each side stove top without a time estimate. But also left a lot of room for possibly over-cooking and drying them out. 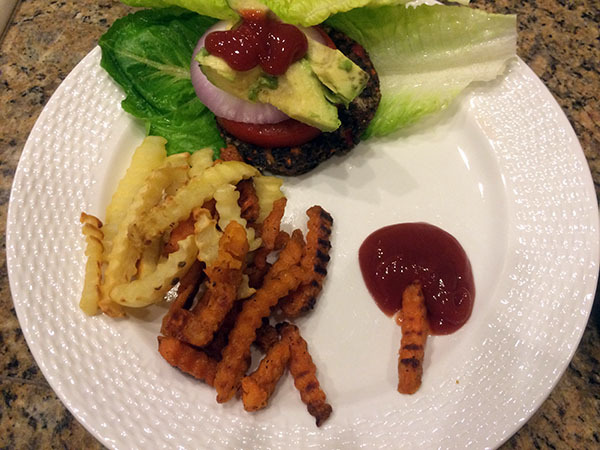 I served a patty in a simple lettuce wrap with veggies and fries. And the flavor was good, not great, but good. It had a nice level of spicy heat and texture, but also a little dry and not a ton of flavor which can be fixed easily layering sauces and veggies. A worthwhile vegan option. 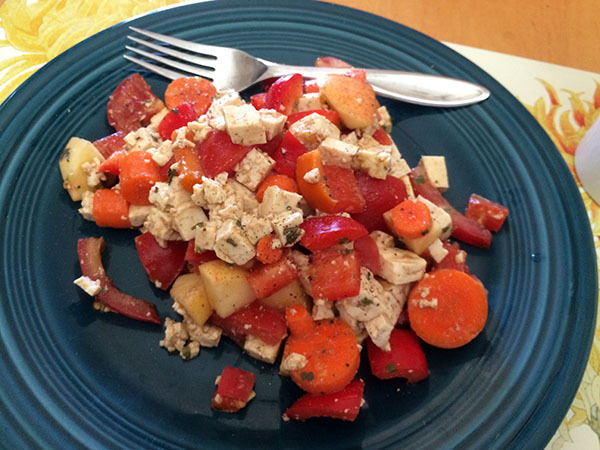 I also threw together a simple tofu salad this weekend dressed with garlic powder, basil, balsamic vinegar, and salt and pepper. A added apple for a little sweet kick and it was tasty for a simple meal salad. And I’ve been doing a little pantry cleaning using up items while saving money for the holidays. 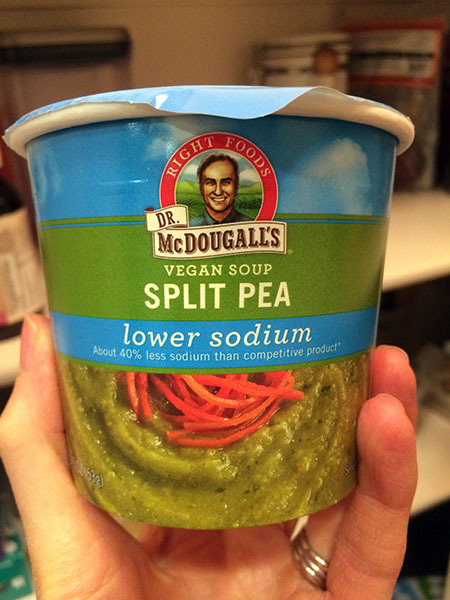 Awhile back my husband was really into Dr. McDougall’s Vegan Split Pea soup, so much so that I was ordering cases from Amazon. Apparently that craving has moved on and I have a pantry full of these. I made a basic quinoa stew last night that used up about a cup of leftover quinoa from the pantry, but it needed a little something in the flavor department. I simmered in the peas and seasoning packets from one of the soups for a creative meal. And it was delicious! 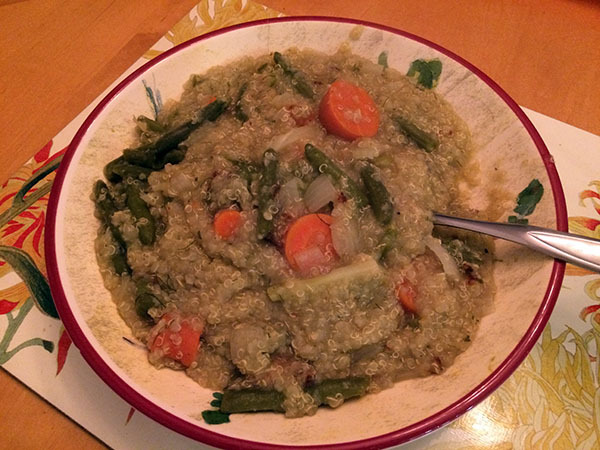 The soup added a hearty and creamy texture to the quinoa while making it more of a hearty one-pot meal. I will be making that again soon and maybe try with leftover rice next, hmmmm. 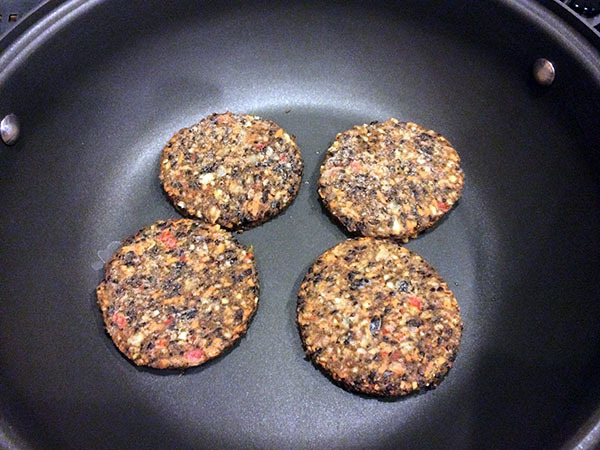 Those veggie burgers looked amazing, not like the typical frozen hockey pucks that come out of cardboard boxes! Too bad they didn’t have a lot of flavor. 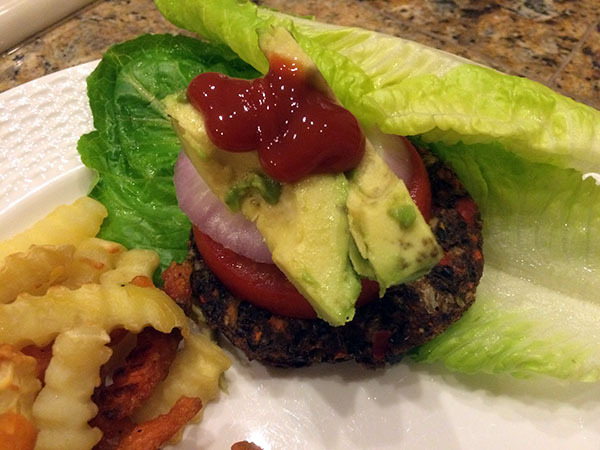 I try and stay away from the processed burgers because they contain the bad kind of soy and other preservatives. Some even have egg in them. I’m still trying to find the perfect frozen burger, I’ll let you know if I ever do. 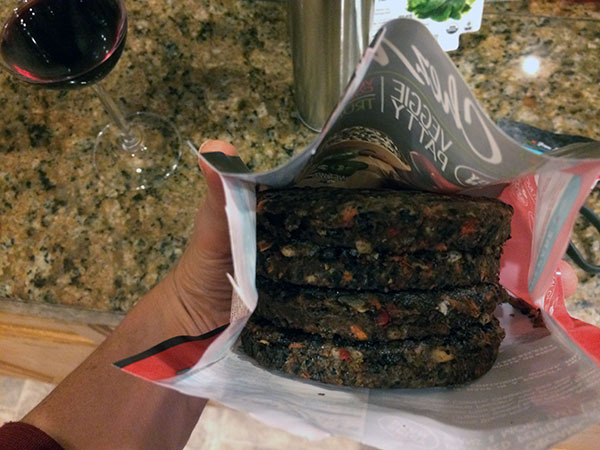 True on the burgers, I like the visible veggies in the patties. True, it can be hard to find a good vegan burger. I like the Sunshine Burgers, but they’re pricey and hard to find. I LOVE those Split Pea Cups! Haven’t had them in a while. The Quinoa looks great! The burgers, too! The cups are good and really great in quinoa! Thanks on the trip!